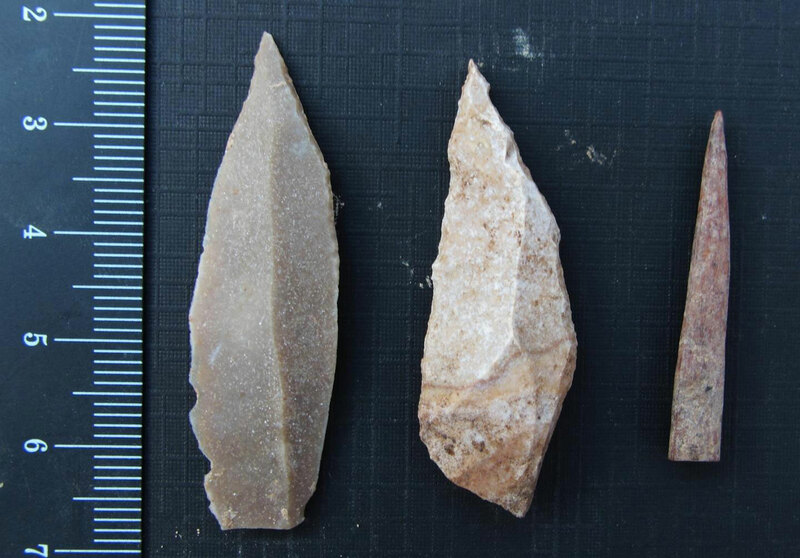 Two stone tool points were made using a prismatic blade technique (left and center), and a bone point or needle (right). Credit: Photo by Aaron Stutz, Emory University. Thousands of stone tools from the early Upper Paleolithic, unearthed from a cave in Jordan, reveal clues about how humans may have started organizing into more complex social groups by planning tasks and specializing in different technical skills. The Journal of Human Evolution published a study of the artifacts from Mughr el-Hamamah, or Cave of the Doves, led by Emory University anthropologists Liv Nilsson Stutz and Aaron Jonas Stutz. The rich array of artifacts shows a mix of techniques for making points, blades, scrapers and cutting flakes. “These toolmakers appear to have achieved a division of labor that may have been part of an emerging pattern of more organized social structures,” Stutz says. The theory that greater social division of labor was important at this prehistoric juncture was first put forward by anthropologists Steven Kuhn and Mary Stiner. This pivotal time also marked the ebbing of Neanderthals as a last wave of anatomically modern humans spread out from Africa and into the Near East. This region, also known as the Levant, comprises the eastern Mediterranean at the crossroads of western Asia and northeast Africa. As the final surge of modern humans passed through the Levant, they would likely have encountered human populations that arrived earlier, and they may also have interbred with Neanderthals. Mughr el-Hamamah is located in a limestone outcrop 240 feet above sea level. It overlooks the Jordan Valley, opposite the Nablus Mountains in the West Bank. The Stutzes, a husband-and-wife team, led excavations of the cave in 2010, funded by a grant from the National Science Foundation. The relatively undisturbed Upper Paleolithic layer included fireplaces stacked atop one another that yielded chunks of well-preserved charcoal from hearths associated with the tools. Co-authors Jeff Pigati of the U.S. Geological Survey and Jim Wilson of Aeon Laboratories derived radiocarbon dates for the charcoal specimens, using advanced techniques that minimized the chances of contamination. Toolmaking was a major activity of the group, as evidenced by their prolific output. Co-author John Shea, an anthropologist from Stony Brook University and an expert flint knapper himself, is continuing to analyze the thousands of implements they left behind. Through this method, the toolmakers could have efficiently produced the armature for multiple hunters going out on a lengthy foray, increasing the chances for finding and striking a target, he says. Artifacts from the cave also included scraping tools, made on thick blades for hafting onto a handle and likely used for working wood and animal hides. Other tools continued to be crafted with what is known as the Levallois technique, which was more often used to make the multi-use flakes and triangular points so common in earlier periods. Even more surprising, Shea’s analysis identified hundreds of basic flakes made from the oldest, easiest Stone Age technology of striking a rock that the toolmaker balances on a stone anvil. These tiny, sharp flakes may have served almost like disposable cutlery – handy implements that could be grabbed for a variety of purposes and tossed aside when no longer needed, Stutz says. It is not yet known if the few fragments of human bones found at Mughr el-Hamamah have left enough intact fragments of DNA for any genetic analysis. But the diverse tool technologies, in use throughout the occupation period of the cave, support the theory of hunter-gatherer populations starting to band together in larger, more interconnected social networks. As humans began to dominate the landscape, the researchers theorize, they reached a population density threshold for living in larger groups and gained access to a range of technologies. That process may have helped tip the balance for the rise of modern human culture and the disappearance of the Neanderthals.